The love of fizz over Christmas doesn’t seem to be going away and whilst the supermarkets slug it out over who can get people to drive across town to get the cheapest Champagne, there’s other sparkling wines available, and unless it absolutely positively has to be Champagne then there’s better value to be had elsewhere. Australia and New Zealand are turning out some good sparklers, but you’ll have to pay for them to travel half way around the world. Oil prices may be falling, but is that something you really want to do if you live in Europe? English sparkling wines can be sublime, but you do have to pay for the grapes to be grown in South East England, where and prices are eye wateringly high. Italy has been riding high in the sparkling stakes, Prosecco has been “on-trend” for a few years now, which sadly means higher prices for the good stuff and lower quality for the more affordable bottles. Meanwhile Cava seems to have fallen out of favour. That’s a shame for Spanish producers, but probably not for you, as you can pick up great Cava that will taste just as good as a Prosecco costing 50% more or a Champagne at double the price. 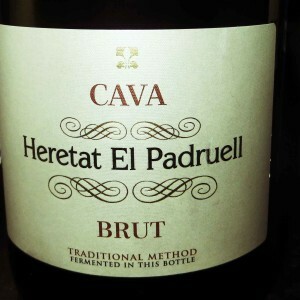 I did not have high hopes for this Heretat el Padruell Cava NV as it came in a bundle deal from Marks and Spencer. I can’t remember the exact purchasing combo required, but it came in a multi-buy deal with “party food” so if you bought a pack or three of vol-au-vents, or whatever the non-1970’s equivalents are called these days you could throw in a bottle of this Cava as a “party snack” bringing it in at about £5.50. It was surprisingly good, with a robust fizz and mousse, a fruity flavour and smooth finish. At 11.5% alcohol it was easy drinking. No need to add anything to it to make it drinkable it was really good on its own but at that price it would not have felt wasteful to make Kir, Bucks Fizz or Bellini’s out of this. Even at the current retail price of £8 at Marks and Spencer online this is a great choice for sparkles, and there’s a Rosado option too if you’d like to add a pink glow to your festivities. It may be time to stage a Cava comeback.